In the Genoese bridge collapse on Tuesday 39 people died, as almost 40 vehicles fell roughly 330 feet to the railway tracks just below the bridge. A few hours after the collapse of the Genoese bridge, Italian Interior Minister Matteo Salvini was filmed on holiday in Sicily. The images of him that started circulating online have drawn a barrage of criticism, with some people even calling for the minister’s resignation. The snaps originally shared by members of Salvini’s Northern League party (they apparently took them down for ethical reasons), show that at the time the emergency services began removing the dead bodies from the under the rubble, the minister himself was enjoying a chic dinner in honor of his party in Messina. The table features a variety of fish dishes, white wine and also a cake with a very motivational theme: "Vince la squadra" ("The team wins"). — Cancun.Pw (@cancun_pw) 17 августа 2018 г. The president of the Democratic Party, Matteo Orfini, was quick to voice criticsm as soon as the snapshots emerged. "Public servants have a duty to carry out their duties with discipline and honor, according to the Constitution. Salvini's images of celebration during these dramatic hours for Genoa are a slap in the face of the pain our country is suffering and the denial of this principle,” Italian Blitz Quotidiano quoted him as saying, with many more expressing their condemnation. "Continued his party at Furci Siculo the evening the bridge collapsed, while the wounded were being helped and the dead were counted? Salvini!" one person heartily exclaimed. — GioDG53 ® 🇪🇺🇮🇹 (@GioDg53) 16 августа 2018 г. “I do not remember an episode from an equally disgusting minister. #Salvini is so inadequate as not to be able to avoid even a party on the beach (despite being on holiday forever),” another user remarked. La foto l'avete già vista. Sapete che è la sera della tragedia del #PonteMorandi. — IlGuffanti 🇪🇺 🇮🇹 (@guffanti_marco) 17 августа 2018 г. “Here the hypocrite, braggart and fascist Minister #Salvini deeply affected by the tragedy of #Genova,” a Spanish Twitter user wrote. “Said that 17 families refused the state funeral… It was also necessary to stop the party in which he participated on the evening of 14 in Sicily,” another person posted. — Reverendo Casey (@reverendo_casey) 17 августа 2018 г. Many appeared to be literally lost for words. Scusate fate polemica per la Ferragni e non fare polemica per il Ministro Salvini che ha fatto festa alla sera di quel maledetto giorno?? Non ho parole. — Gio' (@Giojjo) 17 августа 2018 г. — Heisenberg 🇪🇸 (@WaltWhite77) 17 августа 2018 г. Others directly pointed to the place where Salvini should have been at the time — "at the ministry or in Genoa." — antonio (@antoluigi54) 16 августа 2018 г.
Italy’s anti-establishment Five Star Movement, who the League has struck a deal with, has also been blasted as in the past it ignored multiple warnings about the danger of the collapse of the Morandi Bridge in Genoa and opposed the construction of an alternative road in the area. The founder of Five Star, comic Beppe Grillo previously billed the potential collapse of the viaduct as “a tale,” according to Italian media. He, like his fellow M5S members, also spoke out against the so-called “Gronda” project to connect Genoa with the town of Vesima, which could have been an alternative for the stretch of road where the bridge collapsed. Indeed, but perhaps before stretching to blame Brussels, Salvini & Co might ask why the M5S mounted a major campaign for the last few years against infrastructure projects in Genoa, including improvements & repairs to the Morandi Bridge? — Adam Robins (@A_D_Robins) 16 августа 2018 г. "The reaction of the Italian government is absurd. Blaming the EU budget is simply wrong: the jobs that could have avoided the disaster have been severely opposed by the M5S." The "use of tragedy" for "political purposes" has also proved a popular rhetoric. — Giovanni Camarda (@_gio_cam) 16 августа 2018 г. “The 5-Star Party are now the ones with blood on their hands,” one Twitter user stressed. — 114 #FBPE Saboteuse (@natachakennedy) 15 августа 2018 г. 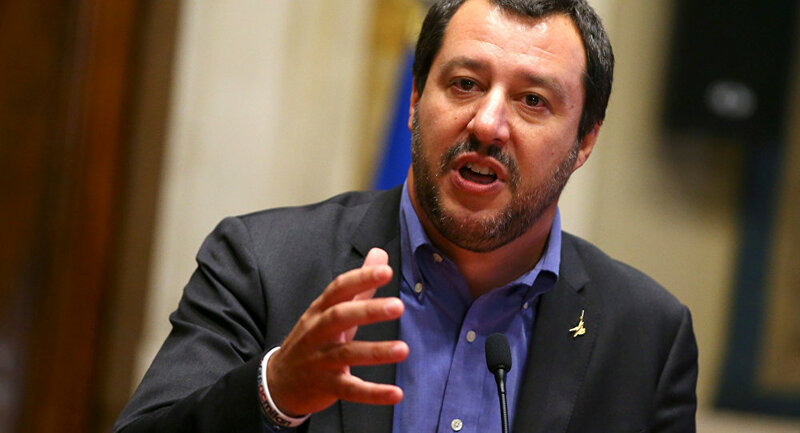 On Tuesday, Salvini put the blame over the deadly accident on the EU’s financial policies, namely the bloc’s restrictive spending rules. “Should there be any European constraints that prevent us from spending money to secure the schools where our children go or the highways on which our workers travel — we will put in front of everything and everyone the security of the Italians” he told the press in a message which swirled around social media platforms on Tuesday, earning a massive outreach. A section of the Morandi Bridge collapsed on Tuesday, sending at least 30 cars cascading down from a height of 100 meters (328 feet). The incident claimed the lives of 39 people, including four French citizens, three Chileans, a Peruvian and a Colombian, who had lived in Italy for years, as well as two Albanians. Rescuers are still searching under the rubble hoping to find missing persons, while CCTV cameras are being examined to determine the exact number of vehicles that were moving over the bridge at the time of the collapse. The state prosecutor’s office has opened an investigation into the accident and a special inspection commission has started work.